One of the biggest problems with wooden fences is that, unlike quality vinyl fencing, wood doesn’t always hold its shape and strength over long periods. Over the years, the constant exposure to wind, water, heat and cold can cause your once-attractive fence to sag, bow, lean or buckle. Fixing these problems isn’t exactly the work of a moment, but it is possible to rescue a leaning fence and give it a longer life. In most cases, fences will begin to lean at the posts. There are many things that can cause a fence to lean, including excessive moisture softening the ground, rot weakening the fence posts, and wind or ice putting too much strain on the fence panels. 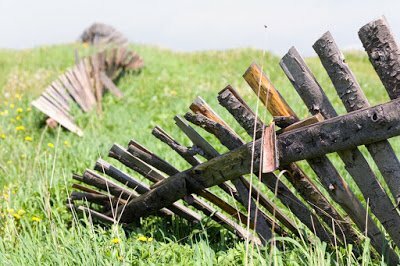 Regardless of the cause, you don’t want to ignore a leaning fence post – it will only get worse as time goes on. Dig out the old post – You’ll need to dig a hole around the old post on both sides of the fence until you hit the bottom. Most posts are set at least two feet into the ground, though some might be deeper. Break up the footing – Often, fence posts are set in a concrete footer that keeps them weighted down and in place. If your fence has concrete footers, you’ll need to break it up with a sledgehammer and chisel or a jackhammer in order to free the post. Make sure you remove the concrete debris from the hole as well – it will only get in the way later. At this point, you’ll need to determine exactly what the problem with the post is. In some cases the fence post itself will still be in good condition, in which case you can skip to step 4 below. However, if your fence post is rotten or broken you will need to replace it first. Replace the Old Post – Use a claw hammer to remove the nails holding the fence panel to the post. Remember to brace the fence panels with some boards before removing the post – you can use 2x4s positioned at a 45 degree angle on both sides of the fence to keep it from falling over. Once you have the old post free, replace it with a treated 4x4 post – never use untreated lumber for a fence. Plumb the Fence Post – The next step will be making sure your fence post is straight and level. Use a carpenter’s level or square level to position the post correctly, and then nail some long 2x4 boards to the post at a 45 degree angle to brace it against the ground and hold it in place. Once the post is temporarily secure, pour a new concrete footer around the base and allow it to cure according to the instructions. This should be enough to secure the post and ensure it doesn’t move again. Fill in your Hole – The final step to resetting your fence post is to fill in the hole you dug. When this is complete, your fence should be as good as new. In some circumstances, a fence can be badly damaged by leaning, or it might be too much work and effort to get it back in shape again. And sometimes, even after you repair your fence, it can still look old and ready to break down again soon. In these cases you might be better off replacing your entire fence with a new, stronger fence such as a vinyl fence. Besides the fact that they stay looking like new for decades, vinyl fences are also stronger than wooden ones and less likely to lean or buckle due to weather or shifting ground. And since the fence posts never rot, you’ll never need to replace them due to old age or moisture. This makes them perfect for the homeowner that wants a dependable, long-lasting fence for his or her yard. If you’re interested in replacing your current fence with a high-quality vinyl fence, contact us today at Future Outdoors®. We’ve installed hundreds of miles of tough, dependable vinyl fencing in and around the Dallas metropolitan area, and we’d love to make your fence our next project. Call us today at (972) 576-1600 or visit our Facebook page for more information and helpful advice.